Don’t be fooled by the unremarkable exterior of Googles new Nexus 5 phone as it combines the latest Android 4.4 Kitkat with high end hardware specifications, to give buyers exceptional value for money and raw speed. I’ve been testing Google’s new Nexus 5 Android smartphone for the last few weeks and found it to be a compelling option, especially for readers who want a high end smartphone without having to spend $650-$1000 dollars. There are no other phones even close to offering the same value for money that the Nexus 5 does, selling for $399/16GB or $449/32GB plus shipping directly from the Google Play Store. This is especially clear when you first use the stunning 5 inch full HD 1920×1080 resolution screen protected by Corning Gorilla Glass 3 and experience the blazing speed enabled by the high end Qualcomm Snapdragon 800 CPU and Adreno 330 GPU inside. For readers unfamiliar with Google’s Nexus line of devices, they’re built by one of the Android phone manufacturers to Google’s specifications (in this case LG). Historically they’ve been very sharply priced with minimal if any profit margin, unlocked devices which offer the latest version of Android updated directly by Google without mobile carrier delays and allow easy full “root” (administrator/developer) access to modify the operating system and develop apps. In terms of size the Nexus 5 is almost the same as a Samsung Galaxy S4 and weighs in at 130g. The volume rocker is located at top left, headphone jack top left, power button and microsim card slot top right, single speaker at the bottom and microusb charger port mid-bottom. Note that Nexus devices do not have expandable microSD card slots, only on-board storage space. Battery life is surprisingly good considering the Nexus 5 is a fast 4G phone and the battery capacity is only mid-range at 2300 mAh. Low to medium intensity users will find the Nexus 5 has enough charge to last a day but heavy users who read and download a lot of data on their phone or use a lot of GPS location apps will need to charge their phone by mid-afternoon. Telstra has decided to sell the Nexus 5 through its stores but I recommend readers don’t take this option as Telstra is charging $699 for the 16GB storage model outright and for the plan price including a phone you’d be better off getting the Samsung Galaxy S4. The Nexus 5 supports fast 4G data speeds for Telstra, Optus and Vodafone which is a welcome upgrade from the 3G only capable Nexus 4. Note that the Nexus 5 lacks support for the new 2300Mhz extra Optus 4G Plus coverage. Other connectivity features include support for 802.11 a/b/g/n/ac dual-band Wi-Fi (2.4G/5G), NFC and Bluetooth 4.0. Caller ID by Google is a helpful new Android 4.4 feature (for Nexus 4 and 5 only) that can identify some of your inbound and outbound numbers by using business data in Google Places map listings, even if they aren’t stored in your People contacts list. Ironically the first time I experienced it was when I received a call from a staff member at the Samsung Electronics Australia office about a faulty Galaxy S4 I had sent to them for warranty replacement. Business users who often need to work with Microsoft Office files or Google Docs are well catered for as Kitkat 4.4 includes Quickoffice preinstalled. If you use a lot of Google services such as Gmail, Maps, Calendar and Search then the new location for Google Now on the left most desktop screen will be a welcome digital assistant, offering useful information like travel time to your next meeting, stock prices etc. 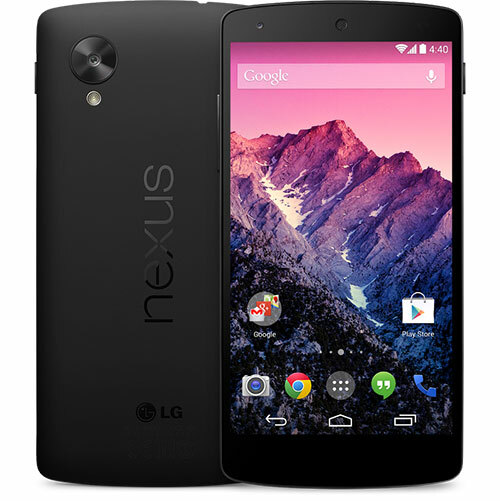 Android Device Manager can be enabled for your Nexus 5 by opening the Google Settings app. This will let you remotely locate your phone online as well as remote lock, remote wipe or cause it to ring. Obviously this requires the lost/stolen phone to be on and connected to a mobile phone tower or the internet. Another nice productivity feature is the new full screen edge to edge reading experience, for example if you’re reading a long website article all you need to do is swipe up slightly to reveal the status and navigation bars. The Nexus 5 user experience could have been even better except for a few software functionality and software design issues by Google. In an annoying move the Google+ Hangouts app has been merged with the Android SMS Messaging app which creates a poor user experience. Thankfully the default Messaging app can be changed. I suggest the 8SMS by Thinkleft app which is free on the Google Play Store. Similarly the 8MP camera hardware with optical image stabilisation is let down because Google needs to drastically improve the Kitkat 4.4 default Android camera app by improving it’s slow shutter speed, using a better menu system and allowing ISO to be set. For an in-depth look at the Nexus 5 camera and app see DPreview. The Verge has reporting that “Google has released the Android 4.4.1 update that brings dramatic improvements to its Nexus 5 camera”. I have yet to receive the update on my Nexus 5 as it’s being sent to phones in batches. My extensive testing revealed a few helpful modifications that can be made to improve the Nexus 5 experience. Readers who have a lot of Facebook contacts can use UberSync Facebook Contact Sync to import HD contact photos, phone numbers etc into the People contacts app. By enabling hidden Developer options (Settings, About phone, tap Build number seven times, Return to the previous screen) you can set the 3 animation/transition settings to Off. Instead of the battery indicator at top left of screen just being solid white you can enable capacity percentage remaining to be displayed as well.